The Spray Booth industries most trusted provider of maintenance & breakdown services. 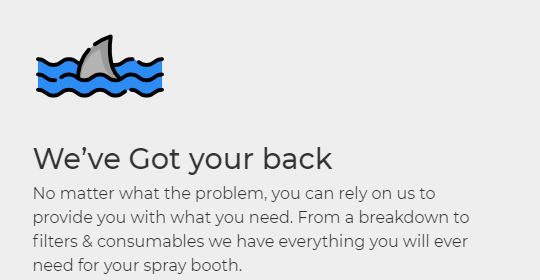 Our service technicians are experienced so they can handle any repair on your booth. We can get you going quickly and also set you up on a regular service plan. If your spray booth is not working properly, heating has faulted or its just not performing as it should you can rely on our experienced technicians to respond quickly and resolve the problem. We provide initial technical support in order to best diagnose the type of fault and then send the most appropriately qualified technician to site to rectify or identify the problem. Should parts be required to repair you can be sure that we either stock the parts or have them quickly available via our national supplier network. Type B Gas Servicing: Direct fired gas & oil burner servicing.